Michigan International Speedway is located near Brooklyn, Michigan in the Irish Hills area and can be reached from Novi by several routes. The usual driving time with no traffic is about 1 1/4 hours but plan on taking longer – sometimes much longer – during drive time on Friday afternoon and on Sunday. Once inside the site, you are looking for the Worker Camp, and our campsites are in Section 8, rows B and C, sites 29 and 30. Parking within the campsite is limited or not possible, but you may park across the access road Friday and Saturday. On Sunday, parking, though still free, is more strictly controlled and cars may need to be moved early. Important: On Sunday, traffic is one-way into MIS starting at 6AM, and reverses to one-way out of the area with 50 laps to go. After 50 laps to go, you will not be able to get into MIS so be sure to plan your trip to arrive early if you are driving out on Sunday! We will be cleaning the even-numbered sections 8 through 18 of the main grandstands after each day’s race. Times are to be announced but cleaning generally starts in the late afternoon, so we need to be at the stands as the race ends. With a full crew, the work should take 2-3 hours. You can catch a ride on the bottle & can trailer or on one of the MIS shuttles that stops near the campsite. Sunday Outbound Traffic Pattern Map in effect with 50 laps to go until all traffic has cleared the area. If you wish to take US-12, you must exit the grounds at gates 8 or 9; if taking M-50, you must exit at the main gate. 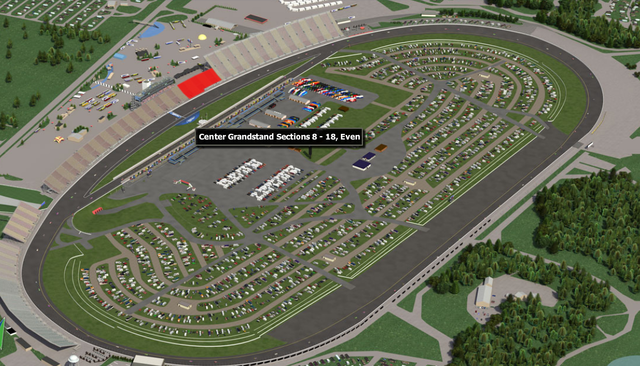 The MIS website is http://www.mispeedway.com and has much more information on the track and the races. Be clean in our outdoor manners – We don’t litter or disturb the nature of our surroundings. We clean up after ourselves and pick up trash left by others. We dispose of food waste in appropriate designated trash containers, and scatter dirty water over a wide area rather than in a single puddle. Be careful with fire – Even though some campers may have ground fires, we do not. Our campsite is small and is immediately adjacent to other campers, and the smoke from fires can disturb others. We don’t really have enough room to ensure a clear space around a campfire. Be considerate in the outdoors – We observe quiet hours as established by the camp, even if others don’t. Our neighbors, for instance, may need to be up at 5:00 am in order to get to their work stations. We don’t enter other sites or cross them without first asking for permission. We help other campers as we would like to have others help us. Be conservation-minded – We disturb our campsite as little as possible. We don’t alter the landscape (such as digging holes) and we repair any damage we do. We don’t “rearrange nature” by moving rocks, branches or other objects.